Unemployment was higher in urban areas at 7.8 per cent as compared to 5.3 per cent in rural areas of the country. 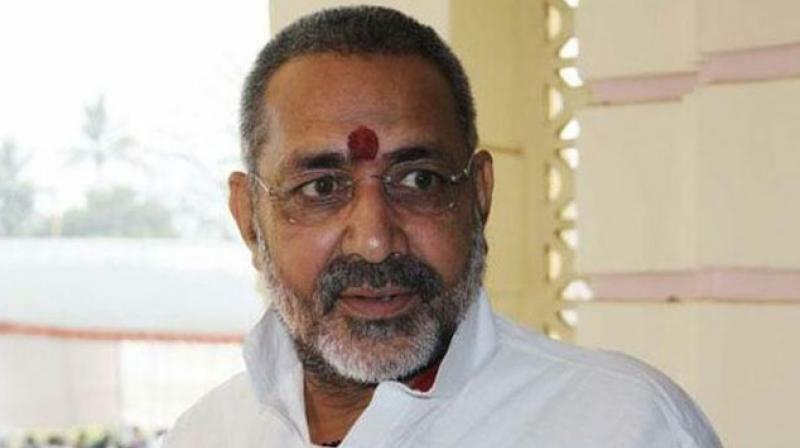 New Delhi: Union minister Giriraj Singh on Tuesday said micro, small and medium enterprises in the country have provided jobs to 10 crore people between 2014-18, terming it a "tight slap" on people raising a "propaganda" to defame MSMEs. His comments came days after media reports suggested that a periodic labour force survey of the National Sample Survey Office found the unemployment rate in 2017-18 was the highest since 1972-73 when it was 2.2 per cent. Singh, the Union Minister for Micro, Small and Medium Enterprises (MSME), observed that between 2014 and 2018, 18 lakh entrepreneurs availed loans under the credit guarantee scheme, as against only 11 lakh entrepreneurs between 2010-14. He also said two lakh entrepreneurs benefited from the Prime Minister's Employment Guarantee Programme between 2014-18 taking the overall number to 20 lakh. According to him, existing MSME units gave employment to a minimum seven crore people while enterprises set up by new entrepreneurs provided jobs to three crore people. "How is employment falling when 20 lakh entrepreneurs are standing up. If someone says it is night now I will not agree because I am talking during the day. With full confidence and full evidence I say that a situation to spread confusion is being created in the country," he said, addressing the stakeholders' consultation meeting on national SC/ST hub here. "MSMEs have provided jobs to 10 crore people in the past four years. This is not word of mouth but based on a survey. It is a tight slap on the names of people who are raising a propaganda to defame MSMEs. When the GDP is rising, inflation is falling, how can the employment fall," Singh said. The NSSO survey reportedly was based on data collected between July 2017 and June 2018 and is the first official survey post-demonetisation. The news report further said that unemployment was higher in urban areas at 7.8 per cent as compared to 5.3 per cent in rural areas of the country. Earlier, the Centre for Monitoring Indian Economy (CMIE) had stated that 1.5 million jobs were lost just in the first four months of 2017 -- immediately after demonetisation of old 500 and 1000 rupee notes. The NSSO job report was previously planned to be released in December 2018.